This deep bronze to purple form of annual fennel is really a short lived perennial. Tall feathery fronds not only smell and taste of anise, but are beautiful in floral arrangements. Grown in clumps, they become an edible accent in any garden. Yellow umbel flowers produce the fennel seed prized in the kitchen. 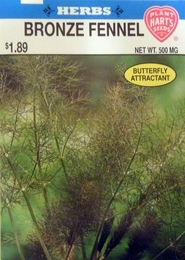 Fennel, parsley, dill and carrots are host plants for the black swallowtail butterfly. Look for the black and green striped caterpillar with yellow spots. Watch it grow, make a chrysalis and morph into one of the most beautiful butterflies in North America. Plant enough to share with these caterpillars. Seed spacing - 10 seeds per clump.